BSNL JAO Syllabus 2019 (बीएसएनएल जेएओ पाठ्यक्रम 2019- जूनियर लेखा अधिकारी परीक्षा पैटर्न डाउनलोड करें): Bharat Sanchar Nigam Limited has released the recruitment Notification of various vacancies for Junior Accounts Officer posts. Candidates who have applied for the Junior Accounts Officer Vacancy can download the BSNL Recruitment Junior Account Officer-Syllabus. The organization is going to conduct the Online Competitive Examination for JAO post in coming weeks. Aspirants who are preparing hard for BSNL Examination can go through the BSNL JAO Exam Pattern Syllabus details for the best exam preparation which is given the below section. The BSNL (Bharat Sanchar Nigam Limited) is a government enterprise which conducts several examinations all throughout the year for the Government Recruitment of various posts in the various circle of BSNL. Now, the BSNL is going to recruits the well skilled and talented candidate for the Junior Accounts Officer posts. 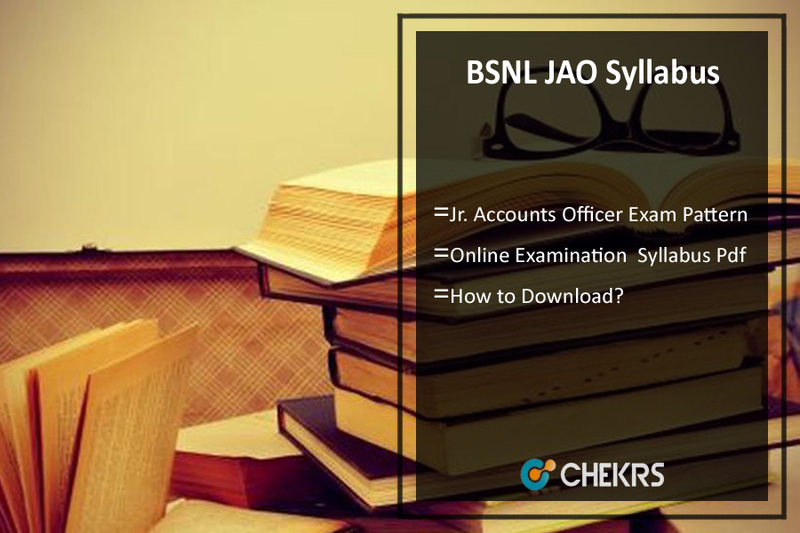 Applicants are invited to download the BSNL JAO Exam Syllabus Pdf for the best exam preparation can score the good marks in the exam. The exam syllabus Pdf will contain the all necessary topics which will important for the exam question papers. Here we have shared the BSNL Jr. Accounts Officer Exam Pattern which will contain the questions number, time duration, and papers details. Read the whole article and can get the BSNL JAO Exam Syllabus 2019 details. After completing the online application, candidates can download the BSNL Jr. Accounts Officer Syllabus for good preparation of Online Examination. Participate candidates can check the complete exam syllabus from here and we have provided the easy steps of exam syllabus Pdf download through the official website. Visit the official website of BSNL (externalexam.bsnl.co.in). Find the DIRECT RECRUITMENT FOR THE POST OF “JUNIOR ACCOUNTS OFFICERS (JAO)” IN BSNL FROM OPEN MARKET THROUGH ONLINE COMPETITIVE EXAMINATIONS -2019. The BSNL JTO Exam Pattern will give the knowledge to the understanding the examination scheme. The BSNL JAO Online Examination will consist of two exam paper and each paper will contain the objective type questions. Each paper time duration will be 3 hours. Candidates who are familiar with BSNL Jr. Accounts Officer Exam Pattern Syllabus they can understand the examination scheme much better. The detailed of Junior Account Officer Syllabus is listed below. Cash and fund flow statements. Planning an audit, audit programmes, working papers, audit process. Financial topics related to balances received and profit and loss accounts. Job aspirants can get the latest alert in concern to BSNL JAO Syllabus 2019 through our web page www.jobs.chekrs.com. We will provide you with the upcoming details of BSNL Model paper. In the case of any query or review, your valuable comments are most welcome in the commenting section below and our team will get in touch with you shortly.